When we crest into the 2020s, the significant mega-matches that comprised this era will each celebrate their semicentennials. Doubtless the print, video, and digital venerations will disseminate accordingly. Richard Hoffer’s Bouts of Mania already set the tempo for Golden Jubilees about prize fighting’s “last golden age.” His fast-paced prose and first-hand accounts recreate the exhilaration triggered by a coterie of great fighters and their saga of brutal bouts. But the Era of Fantastic Millions’ coup de grâce, Muhammad Ali vs. Joe Frazier at the Araneta Coliseum in Quezon City, occurred forty years ago today. In the sobriety of a Ruby Anniversary there is opportunity to review the multiple legacies bestowed by the finale of Ali and Frazier’s trilogy, and the last blow of a short, hot Chinook for heavyweight boxing. In retrospect, the level of heavyweight boxing during the 1970s appears higher than cabbage prices, let alone skirt-length, in the same period—but it was probably less consistent. The epic title bouts were a few peaks among many valleys in the sport’s popularity, and the performances of their principles often largely came as a surprise. For instance, expectations of Ali in his first encounter against Frazier remained very low given his long forced exile from the ring; many derided Foreman as a tune-up opponent for Frazier while he and Ali negotiated a rematch; when the second Ali-Frazier fight came off it lacked the gravitas of a title fight; then requiems for Ali’s career—if not his life—were penned from Zaire as the sporting world awaited the “Rumble in the Jungle”; finally, the steady decline of Frazier had been well-documented leading up to his third meeting with Ali and little hope existed for a bout as competitive as their first two. In short, much like the Klondike, the vast majority did not see the nuggets in front of them as this golden era unfolded. In fact the sport might have barely looked gilded to those in the moment as the politics of prize fighting constantly interrupted or eschewed popular interests, if not common sense. No meaningful heavyweight title fights occurred in 1972 as Frazier and Ali’s second “Super Fight” stalled for more than a year on contract terms, state taxes, and a reasonable fear of earthquakes in California. Frazier’s eventual defense against Foreman faced a cavalcade of legal injunctions that eventually sent their title fight out of the country and into 1973. Between October 1974 and October 1975 Ali looked uninspired against aging veterans Chuck Wepner and Ron Lyle—both more aged if not more veteran than Ali. Frazier did not look any better in a rematch against Jimmy Ellis that took twice as long to complete as their contest for Ali’s vacated title five years previous. Foreman did not even pretend to fight competitively that year, an April exhibition against five heavyweight has-beens and never-was’ in one event at Toronto’s Maple Leaf Gardens notwithstanding. For most of the year, 1975 looked like a deep valley—the kind one might never climb out of. To make matters worse, in advance of his summer defense against Joe Bugner at Kuala Lumpur’s Merdeka Stadium, Ali announced he would retire after the barely-anticipated match. Whether he genuinely considered leaving the ring or the announcement was just a ploy to drum up interest in a sporting event that engendered very little, Ali could not even get through the process of selecting his successor—he narrowed it down to Foreman, Frazier, or Norton—without picking another fight. Rather than a rematch with Foreman, (the youngest and strongest of the cadre), or a rubber-match with Norton, (the last person to defeat Ali and the only one to break his jaw), Ali selected a third meeting with a declining Frazier. While their personal feud escalated through the early 1970s, by the middle of the decade it did not seem likely that another meeting in the ring could keep up with the rhetoric. Then, in the mid-morning of October 1 so as to appear on American closed-circuit television feeds during traditional “prime time” hours, the bell rang. Ali stood flat-footed and threw punches, his long arms tagging Frazier again and again. It took several rounds before “Smokin’ Joe” penetrated the phalanx, but once inside he was nearly impossible to dislodge. Ali tried retreating back into the “rope-a-dope” strategy that, one year earlier, caused Foreman to expend all his energy battering arms and elbows. But Frazier kept boring in with clean, sharp blows to the body that reverberated through the ribs, kidneys, and liver. Finally, with only a few rounds remaining, Ali reenergized and began sticking fast multi-punch combinations that opened up Frazier’s face and shut his eyes. Even that did not prevent him from doling out more punishment to a gasping Ali. After the fourteenth round, Ali asked his cornermen to cut off his gloves—either because he thought he already fought the fifteenth or because he did not want to go out for it. At the same time, Joe Frazier was trying to stop his trainer from throwing in the towel. Frazier’s oratory did not pack the same punch as his fists and he failed to win the argument against Eddie Futch, who could not let a blinded boxer go out for one more round against the heavyweight champion. The international mega-matches of the mid-1970s, however, did not always take place in “civilized countries.” Problematic as that descriptor might be, there could be little doubt that some of the host nations in these transoceanic title fights were governed by autocratic, dictatorial, and flatly oppressive regimes. During the golden era, no one involved in—or profiting from—the events voiced audible opposition. The “Rumble in the Jungle,” a tag-line to which the Zairois government objected almost as vociferously as “Slave ship to Championship,” was imbued with symbols of pan-Africanism and black power. Yet both African American fighters managed to offend the cultural and colonial history of their hosts. Foreman insisted on bringing his dog to Zaire, not recognizing that the German shepherd had been the police dog of choice for more than a century of Belgian colonial control. Ali, icon of the global black freedom struggle, suggested that Zairois people practiced “Voodoo” (the majority self-identified as Christian) as well as cannibalism. Further, both African American superstars sought to improve the lives of black people in the United States yet remained indifferent to the fact that far more black people suffered at the hands of General Mobutu in Zaire than any contemporary American president. The cheering of thousands in Kinshasa’s Stade du 20 Mai allegedly drowned out the screams of political prisoners restrained in cells underneath. Like Zaire, the Philippines was a decolonized nation caught between Cold War superpowers. The autocratic Marcos family, headed by President Ferdinand and his wife Imelda, relied on tight control of their subjects at home and ostentatious displays of wealth to attract investment from abroad. Hosting a heavyweight prize fight was the sporting equivalent of a rare jewel or ancient carving. Although ostensibly devout Christians ruling over a Christian majority, the Marcos family seemed much less interested in the proud Christian Frazier and instead courted the devoted Muslim, Ali. Television cameras broadcast images of Ali at the Marcos’ impressive Malacanan Palace where religious differences were swept under the very expensive rugs just as easily as the first lady’s faux-pas when she introduced Ali’s girlfriend as his wife. 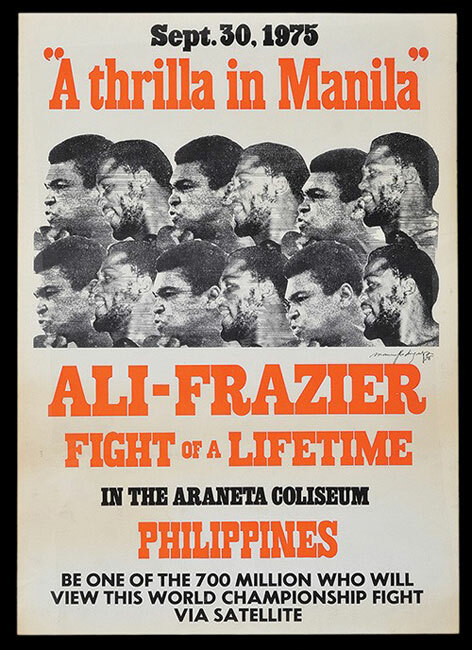 The Filipino government fronted a considerable portion of the Thrilla in Manila—at least $3 million of the $4.5 million Ali had been guaranteed came directly from public funds—although later discoveries that President Marcos siphoned aid money from the U.S. to his personal treasury opens up the possibility that the American government subsidized some of this event as well. Yet the Marcos regime relied primarily on debt-driven growth during their twenty-year reign, borrowing funds which they promptly pumped into social welfare programs, infrastructure improvements, agribusiness investment, and a burgeoning tourism industry. The expense typically fell down to the lowest rungs of the socioeconomic ladder. Backlash against some of these policies as well as the growing wage gap caused significant, and sometimes violent, reactions from political dissidents as well as disgruntled students. To maintain control, President Marcos declared martial law in 1972. 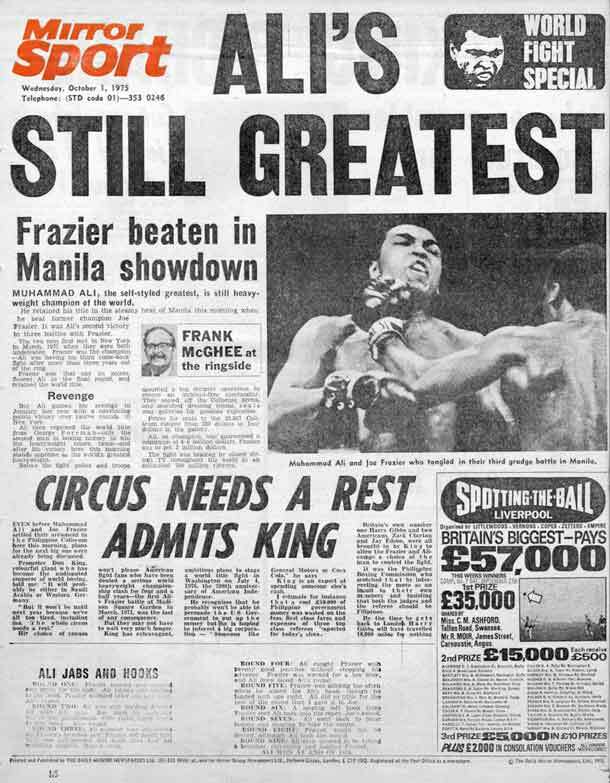 Theoretically a temporary measure, it was still in effect three years later when Frazier and Ali signed the contracts for a prize fight in Quezon City. The primary targets of Marcos’ Proclamation No. 1081 included the Moro National Liberation Front, an Islamic separatist organization that battled for political and religious independence from the Christian Filipino majority. Ali, one of the staunchest anti-authoritarian athletes in the U.S. and one of the most famous American Muslims, did not speak on the persecution of Filipino Muslims. Instead, he returned to Quezon City one year after the fight to dedicate a shopping mall and hint that the biggest city in the Philippines could host his rematch with Foreman as well. 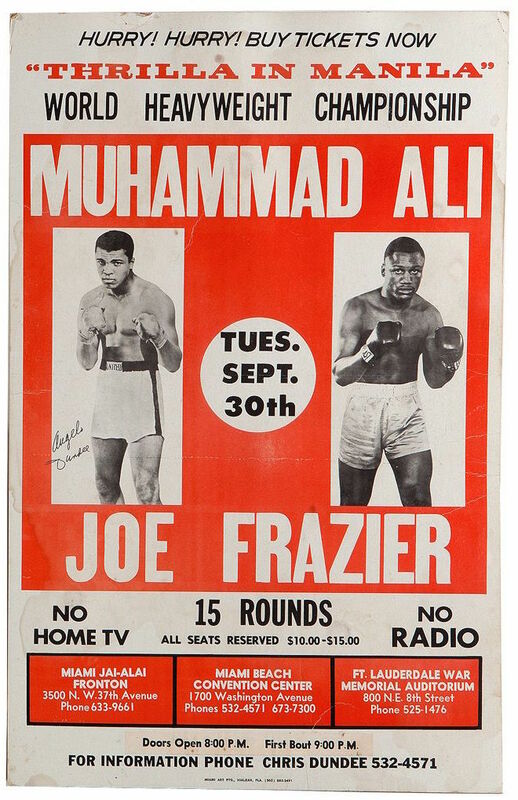 Historians have identified Foreman and Frazier as cultural if not political conservatives at different points in their careers, but fewer have discussed the contradictions between Muhammad Ali’s willingness to challenge inequalities at home while profiting from and for oppressive governments abroad, or the disparity between his status as a liberal icon and member of a fundamentally conservative Nation of Islam. The Realpolitik of prize fighting did not delve into such questions in the Era of Fantastic Millions. The Thrilla in Manila provided as definite a conclusion to a fistic saga anyone could envision, but it was not so immediately clear that it also marked the end of an era. Over the next two years Foreman sent Frazier into retirement after their rematch—one that required both fighters to dress up in gladiator costumes, Revolutionary era regalia, as well as a little bit of drag, in order to boost sales for a bicentennial bout that still lost its promoters $2 million. Then “Big George” suffered his own hiatus-inducing defeat to Jimmy Young. Ali continued to fight lesser competition in unspectacular fights during the interims between his “retirements.” As the sport’s brightest stars faded in the twilight of the 1970s so, too, did the proclivity for promoters and fighters to stage important heavyweight title fights in questionable political environments. By the 1980s, even top African American contenders refused to fight for the championship in South Africa’s “Sun City” as part of the broader anti-Apartheid movement. At the end of the decade a Seattle-based promoter working with Chinese interests toward an eight-figure offer for Mike Tyson vs. George Foreman in Beijing pulled the plug after images of Tiananmen Square reached American televisions. Even the boxing community recognized that their commercialized violence restricted to about 400 square feet should not support actual violence, oppression or terror hundreds of miles away. The Thrilla in Manila was not just the capstone of a “fantastic” era for the fight game but also a cornerstone for movements toward improving the safety of boxers in the ring and the human rights of those outside the ropes. The fiftieth anniversaries of “Super Fight,” the “Sunshine Showdown,” the “Rumble in the Jungle” and the “Thrilla in Manila” will wax poetic about these worldwide mega-matches and an era that can never be replicated. A forty-year retrospective might be the appropriate place to consider the elements of that era that should never be replicated. Dr. Andrew R.M. Smith is a Visiting Assistant Professor of Sport Management and History at Nichols College. He is still trying to find the Twitter but encourages replies to this post on the site, as well as email inquiries at andrew.smith@nichols.edu. I thought this was an intelligent piece of reflection on the golden age and its impact not only on the United States but also on the world. I am a young fellow who has not seen or heard about these fights. I know of the fighters and what each of them has achieved but never really knew how they impacted the world and the society here in the US. As I was reading along, it seemed that there was a lot of hypocrisy going on as the fighters went away to fight in other countries where some of their beliefs has been tested. For example, when the historical “Thrilla in Manilla” took place in the Philippines, there was also an Islamic separatist battle for political and religious independence from the Christian Filipino majority. While the “Muslim” , world champ was there, he didn’t get into any affiliations with the movement or said anything about it which questioned me of why they were really there. One question always came to my mind in boxing now and boxing then. Have boxers set up fights just for the money? Most likely it wouldn’t have been like that, but that question still remains if they really do or don’t for the money at some point in their career. Thanks for your comment. Of course, the nature of the sport is reflected in the name “prize fighting”–it is by and large about the prize, which includes all the revenue earned and divided between non-combatants (from trainers and managers to promoters and, eventually, TV executives). But as I discuss in this piece, during the 1980s there were some instances where essentially human rights issues trumped financial ones in the bidding process for the most valuable heavyweight championship matches. However, this was not an anomaly or just the process of “evolution.” In the 1930s, for example, Nazi Germany desperately wanted to host a title fight between their native son Max Schmeling and Joe Louis. Even though Germany demonstrated its capacity to host major sports events in the Berlin Olympics, the full scope of atrocities committed in the Nazi state had not yet been completely uncovered, and the Second World War had not yet started in Europe, the power brokers of boxing at that time were not sending an African American boxer to fight a Nazi for Hitler’s profit. In that light, some of the machinations of those international mega-matches of the 1970s are just as exceptional as the fights were–a high-tide, perhaps, for venality in a sport named for its reward: prize fighting. This was a thrilling analysis on the anointed “Era of Fantastic Millions” and how it not only impacted the US but the entire world. I enjoy watching fights, however I am not too familiar with these fights during this era. This Golden Era occurred long before I was born so it was cool to read and think about. I am familiar with fighters such as Muhammad Ali and Joe Frazier but I never knew how much of an effect they had on the world of sports. My favorite part about this blog was how fighters traveled to other countries that weren’t necessarily “civilized” to help bring them wealth. Do you think that having fights in different countries, including uncivilized ones, helped increase the popularity of boxing around the world?